I have been associated with Guns N Roses for a very long time. I met Slash, Izzy and Duff in my Hollywood guitar store sometime in late 1985 as I recall and frequently did business with all of them. The band was starting to get a lot of attention in Los Angeles at that time and there were many interactions with most of the band, their friends and crew. During this period, my then partner, Howie Hubberman, had also begun working with the band handling some management and business details, so we were all interconnected. This was Slash's very 1st "Sunburst" Les Paul guitar, which he purchased from our store, Guitars R Us. This beautiful, big quilted top guitar was built by Peter "Max" Baranet and was originally sold to another hugely talented guitarist, artist and friend, Steve Hunter. This was 1 of 2 Max-made replica 1959 Sunburst Les Pauls that Slash acquired from my shop and this guitar has since acquired the nick-name "The Hunter Burst." Slash is still is a friend and customer of my business as are other members of the band and I am grateful for having known and worked with ALL of them and our relationships continue to this day. steward of it for very many years. 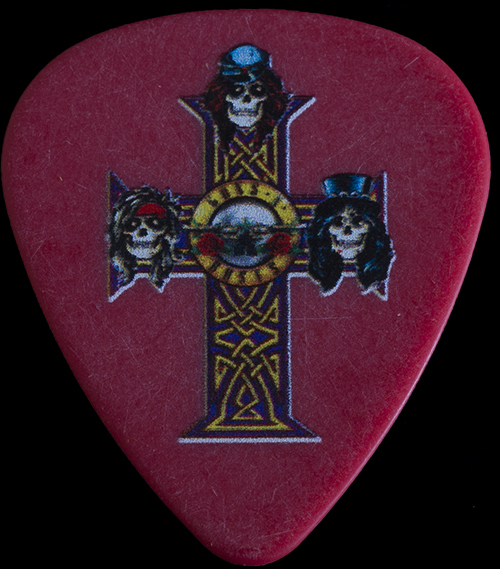 I took this photo when Slash and I got together and I reunited him with it. He had not held or seen this guitar since letting it go back in 1986 or 87 but stated it was fun to visit with it again. The guitar did change hands and currently resides with a happy collector. I recall Slash posting this photo on his own social media pages in the fall of 2016 when I took this photo. Marc Canter's fabulous book is a photographic journal that chronicles the band from the earliest days to the making of "Appetite" and then super-stardom. This book is a MUST HAVE for every GNR fan! 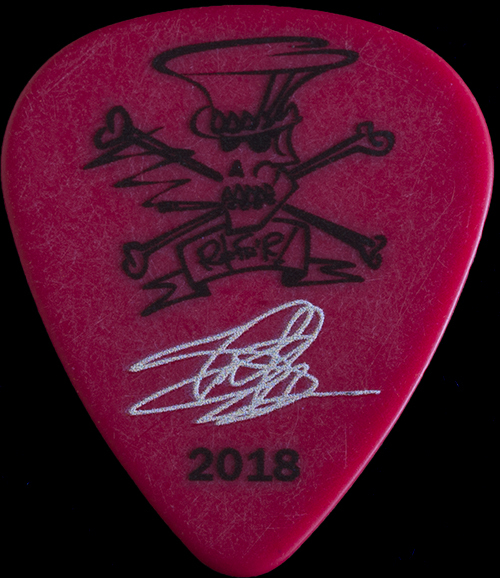 above: some various GNR picks that I had from recent and past interactions with the band and its members.